The International Pentecostal Holiness Advocate was the official church organ of the Pentecostal Holiness Church from 1917 until 1996. The Pentecostal Holiness Advocate was ordered into existence as a result of the Third General Conference of the Pentecostal Holiness Church in Abbeville, South Carolina on January 23-29, 1917. Rev. G. F. Taylor was named editor and business manager of the organ. The first issue of The Pentecostal Holiness Advocate was printed on May 3, 1917 by the Falcon Publishing Company in Falcon, NC. Rev. G. F. Taylor resigned in 1925 and was replaced by Rev. J. H. King as editor and Mr. R. H. Lee was elected as associate editor and business manager. Rev. King continued in his role until 1929. In 1919, The Pentecostal Holiness Advocate was relocated to Royston, GA and was published by the Royston Record from January 1919 through October 1919. It was then moved to the newly formed Advocate Press in nearby Franklin Springs, GA in October 1919. It continued to be published by Advocate Press until April 1995 when the publishing arm of the International Pentecostal Holiness Church became LifeSprings Resources. It was also retitled The International Pentecostal Holiness Advocate on February 3, 1976 to reflect the name change and international fellowship of the International Pentecostal Holiness Church. 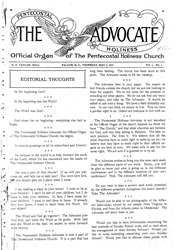 The last issue of The International Pentecostal Holiness Advocate was published in December of 1996.